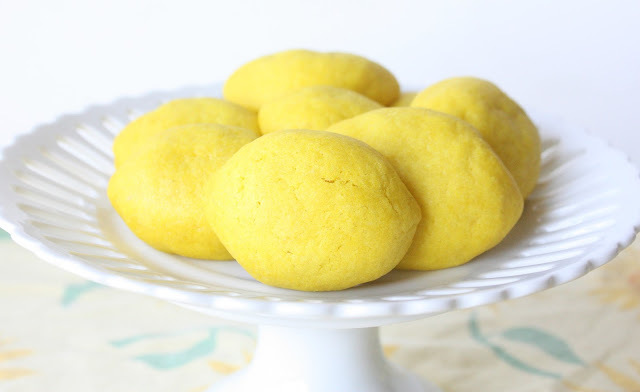 They've all been made with my favorite sugar cookie recipe, but to these lemon cookies I added lemon extract and the zest from one whole lemon. Oh, so lemony and delicious! I was pretty pleased with how they turned out:) The color and the shape (though the backside was flat, the front protruded) ended up looking very much like the real deal. Tinting the dough is sometimes a nice alternative; It's easier, and cuts down on the sugar when the icing is omitted. Next time, maybe I'll try some lime cookies. Of course, the possibilities are endless! *substitute lemon extract for the vanilla, and add the zest of one lemon. 2. Place the dough in the refrigerator to chill (it aids in shaping the cookies). 3. Using a generous ball of dough (my baked cookies ended up about 2.5-in. x 2-in.) try to shape the dough into a lemon shape by tapering the ends. 4. Place on baking sheet and put in the freezer for about 15 minutes, to help hold the shape. From the first glance, I thought they were real lemons! :) the lemon zest must be wonderful and fragrant in these cookies. Love them. These are adorable! Love that they look like real lemons! wow...they look so REAL! These cookies must be divine, Sue. What speaks more than lemon and summer--these cookies are a winner! These are so pretty and they look like real lemons! I cannot believe how much they look like real lemons - and I can only imagine how great they must taste! YUM! I love lemon anything! So perfectly colored and shaped! The perfect pretty lemon cookie! next time life gives me lemons i am making these! :>D they are perfect Sue! You totally tricked me! These really look incredibly similar to real lemons! You're amazing, Sue! I was looking for the cookies, I realized later that those who seem lemons were really cookies! These are so. darn. CUTE!!! Love. I too thought they were real at first. So pretty. Your sunflower cookies are beautiful too. What a presentation. I think they look pretty real and they sound delicious. I bet they smell and taste as good as they sound. Your lemons are so CUTE! These are darling! Lemon is my favorite summer flavor! my kid would love these, he loves everything lemon!! so cool, loving your 3D like sugar cookies!! Such a fun idea. They do look just like lemons. Awesome post! I invite you to link up and share at the TGIF Link Party happening now at APeekIntoMyParadise.blogspot.com. You just might be featured next week! Did anyone else find that the cookies flatten when you bake them? I must have done something wrong, because the ones in the picture look so good! Mine turned out thick and flat. They taste good though! Are the cookies in the picture baked or raw dough? My cuz will love these. He eats anything lemon. Thanks for the great recipe!